Continuing in the same vane as my previous post and indeed from the same helicopter-shoot this photograph was taken within a couple of minutes of ‘Last Light’. 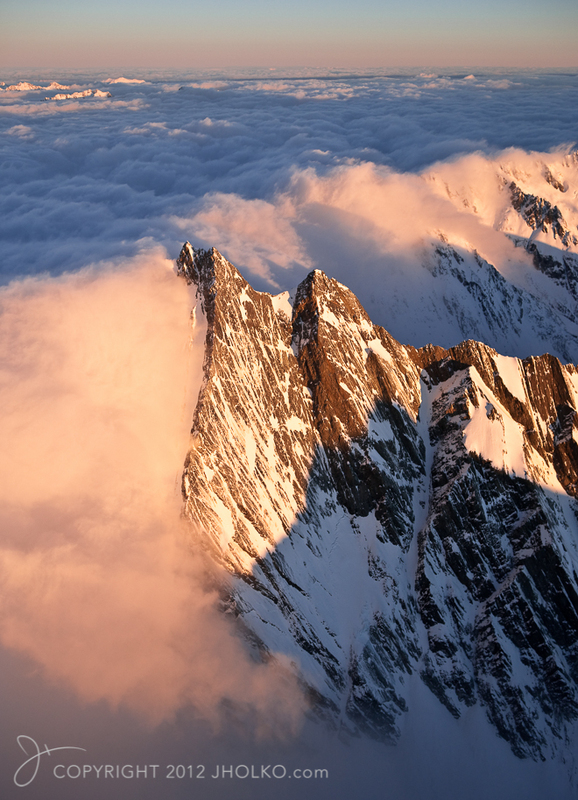 With one side of the Southern Alps completely ensconced in cloud and the sun setting the heavy moisture laden clouds began to spill over the mountains. With the warm orange light of sunset it created a fire fall of cloud and light that was both spectacular and beautiful. Nature at its best. 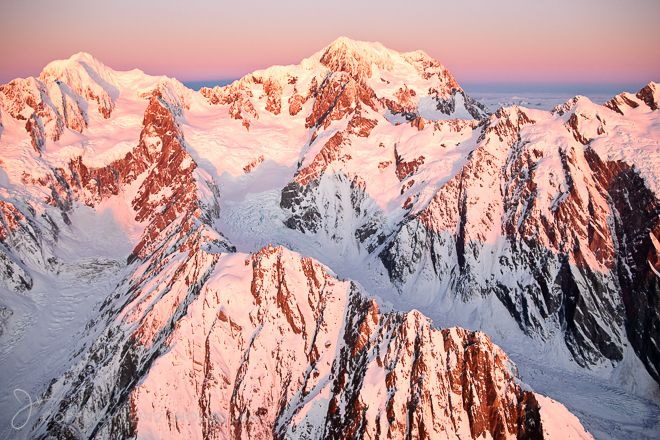 This photograph was taken from a chartered helicopter flight with the doors off (for better photography) at an altitude of approximately eleven thousand feet just as the sun was sinking below the horizon. Mount Tasman can be seen on the left and it’s taller brother Mount Cook (the tallest mountain in New Zealand) to its right. Fox Glacier can be seen in the lower right hand corner of the frame. There is something quite magical and elusive about Alpine Glow. The normal crisp clean whites of the snow and ice are cast in pink and mauve hues that add a wonderful dimensionality and colour that exists for only a few brief minutes when the conditions are perfect. I was very fortunate to be in this spectacular location with perfect weather in the dead of winter and to be able to photograph a wonderful example of Alpine Glow. This photograph was technically quite challenging. The light levels were already very low which meant punching the camera’s ISO right up to 800 in order to keep a shutter speed of at least 1/400th of a second. Shutter speeds of at least 1/400th of a second are needed to avoid any camera shake as a result of the helicopters vibration. I find the Canon EOS 1DSMK3 excellent up to ISO800 so was able to capture this image and apply minimal noise reduction in post processing and achieve an extremely clean tack sharp photograph. Apples New iPad – A New Tool for Photographers? The rumours have been flying for months and we knew it was coming… And now its finally here (we’ll it has been announced and will be here soon) – Apple’s new iPad. If you have not seen the press release head on over to Mac Rumors and have a look at the video. But is it a new tool for digital photographers? Michael Reichmamn over at my favourite photographic website the Luminous Landscape has a good article on the new iPad and gives his impression and thoughts as well. Well worth a read. Time will tell, but my initial impression is this is probably not a tool for most serious digital photographers. One of the biggest disappointments for me is the new iPad wont run Adobe’s Lightroom or Photoshop (the full versions anyway); which makes it pretty useless for anything except showing a portfolio of images to clients. A task which works perfectly well on my macbook pro (or any laptop for that matter) without any issues (as well as running my image editing software). In terms of view of using for preview of captured images…. I can ‘sort’ of see this in the field… but in the studio… forget it. A nice big 26″+ monitor is what the client wants to see images on – not a 10″ screen. The new iPad for me is going to be a great tool for browsing the web and email – unfortunately, I don’t need yet another tool for this purpose. I already have an iPhone, a MacBook Pro and a Mac Pro; all of which serve this function. I dont even know if it will be as good as a kindle for reading books as I prefer the ‘kindle’ style of paper like screen. Time may well prove me wrong.. but initially.. I can’t see this a tool that will be all that useful for the majority of digital photographers. Or rather, it is not a tool that is going to add anything that is not already widely available in a good laptop. 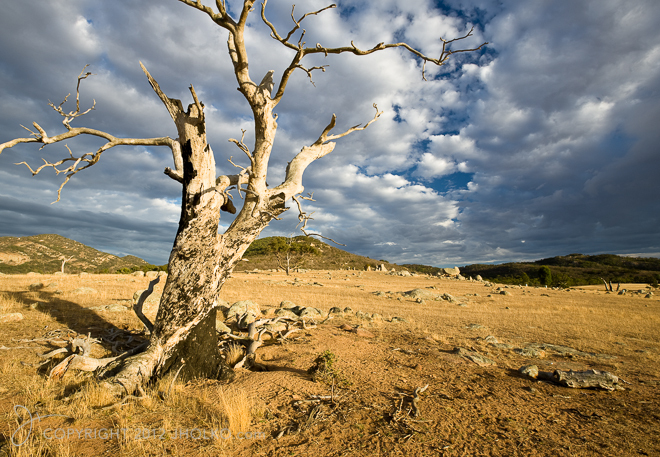 This photograph was taken back in Summer 2008 just outside the You Yangs National Park in Victoria Australia. This relatively small park is often overlooked by landscape photographers given its close proximity to Melbourne; but scattered amongst the granite boulders and gum trees lie many potential photographs. What I really like about this photograph is the juxtaposition of the quintessential (somewhat cliche’) dead gum tree to the line of blue sky through the brewing clouds. The blue sky leads the eye deep into the photograph and adds a dimensionality and balance to the photograph that would have otherwise have been missing – and most likely otherwise resulted in a flat and boring photograph. Taken in the height of summer this is text book Australian drought conditions. This photograph has also been featured on the Channel Two News Weather segment in Melbourne. 2010 – What’s in Store? I will be heading to Iceland in July / August this year for three weeks of dedicated landscape and wilderness photography, with a short stopover in Denmark and London for a few days rest and relaxation – a trip I am very much looking forward to. Although I have never been to Iceland before I have read a great deal about it. From a photography perspective it is widely regarded as one of the finest locations for landscape and wilderness photography in the world. With everything from volcanoes to glaciers and icebergs (and just about everything in between) there is a huge amount of interesting subject matter to photograph. It never truly gets dark in Iceland during the summer; which means the best light for photography (the golden light) lasts for hours. The combination of great light and subject are two of the key components in a good landscape photograph (composition is the third) and I am hopeful of getting all three and capturing some unique and interesting photographs. I am also planning quite a few local photographic trips in Victoria and will head back to Tasmania later in the year for another visit. Another trip to New Zealand is also not out of the question for later this year if time permits. From an equipment perspective it is likely we are going to see an update to my much loved Canon EOS 1DS MK3 in 2010. The new MK IV will undoubtedly offer even more mega-pixels as well as video capability. Whilst I am not overly excited by video per se I am interested in seeing how adding this capability to my equipment will affect my photography. The small pocket Canon S90 that pretty much travels everywhere with me already has video capability and I have used it on several occasions. I will not be rushing to upgrade my MK3 just to have the new model, but am interested in the evolution that is occurring with video in still photography and will undoubtedly rent or borrow one to try. My next landscape outing is most likely to be to Cape Shank near Flinders in Victoria (weather and time permitting) in the next few weeks. With its black basalt cliffs and rocks Cape Shank is one of my favourite locations for ‘ocean-beach’ photography. I want to photograph this location during some stormy weather to best capture its wild essence, so will wait for ideal weather before making the trip.